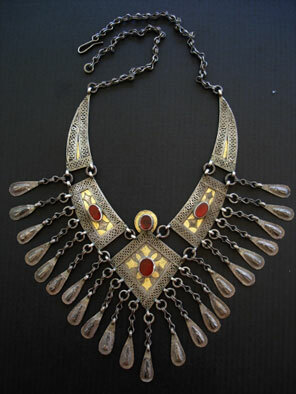 An absolutely stunning vintageTurkoman necklace of 5 linked pendant sections of gold wash over silver, 4 agate cabachons and a cascade of dangles in metal alloy and finished with chain. In excellent original condition and left uncleaned. A treasure and rare find! Necklace length: adjustable to 21"